I finished this last night. Top is all denim pieces with various red fabric accents. 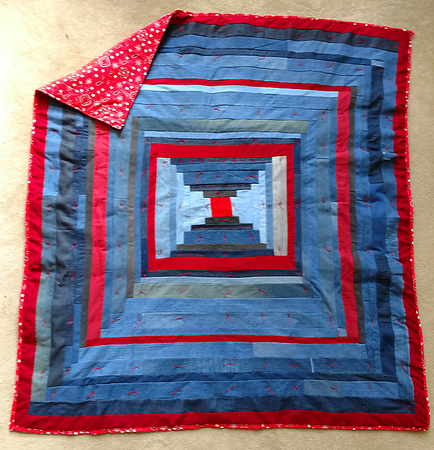 Batting is scrap double-quilted pieces. Back is a bandana print. Tied with red perle cotton. Overall? I'm glad this is finished. I cut the pieces years ago, then went through a couple of sewing machines that couldn't handle denim. I found the pieces this summer and decided to finish it. Original plan was a hecking enormous bed cover, but this year sanity prevailed and I finished it off at 5' square (1.5m). Also, to reiterate, I hate binding. I think I messed up something on the outer rows (entirely possible; this is denim) but at least I got the binding done. This is going into the TV room so it's OK if there are some flaws (coughcoughbindingcough). It's got a nice weight to it and is very comfortable. This entry was originally posted at https://laridian.dreamwidth.org/2938971.html. Please comment there using OpenID.